Playing as a wide receiver for the Arizona Cardinals of the National Football League is a dream come true for Larry Fitzgerald. Before going pro, he showed his athletic prowess playing for the Academy of Holy Angels High and University of Pittsburgh school team. All through his days as a student-athlete, he bagged a lot of accolades and also recorded several impressive counts. His walk through the lane of history an American footballer took form after he was selected by the Arizona Cardinals with the third overall pick in the 2004 National Football League (NFL) draft. He is amongst the few who have featured severally in Pro bowl games; for eleven times. With his impressive records, he is currently noted as the third all-time in receptions, second in receiving yards, and eighth in receiving touchdowns. His records are no surprise as he has prioritized the game and also had his foundations laid by his father who was a sports analyst. Although the football champ is noted as one of the best players in the league, he has been involved in a few love scandals from having been involved in so many relationships and flings as well as fathering two children from two different women. The article below tells more about his affairs, family, Kids and net worth. Larry Fitzgerald is referred to as a momma’s boy; he often times doesn’t finish a sentence without acknowledging his mother, Carol Fitzgerald. Anyone who hasn’t taken a close look at the details of his upbringing might actually conclude that he was raised single-handedly by his mother which is not the case. The footballer was said to have had a very strong tie with his mother but he lost her to a brain hemorrhage in 2003 after her many chemotherapies in her fight against breast cancer failed. It was quite disheartening for the footballer and in a bid to honor her, he carries his hair in dreads just like his mother did while she was alive and always moves around with her driving license. Even though it looked like his mother was his everything, he has a cordial relationship with his father, Larry Fitzgerald Sr. who is also one of his favorite persons. Fitzgerald Sr. has stood by his son and had supported his career from his tender days. In his own days, he worked as a sports reporter for a very long time and also played football during his although he never went pro. In his words, Larry Fitzgerald Jr. acknowledges that he and his younger brother, Marcus Fitzgerald learned the mental aspect of football from their father. With so many news about the footballer’s love escapades, a lot of his fans have been inquisitive to know if truly he had ever walked down the aisle with any lady. From the little we have gathered, he has not made a forever commitment with anyone just yet but of course, he has had a lot of flings and two baby mammas. At the age of 22, he dated a 35-year-old lady named Angela Nazario; the two were said to have been romantically involved in 2006 despite the age differences. With her, he had his first child named Devine Fitzgerald. What seemed to be one of the sweetest story tales went sour as Angela claimed publicly that the footballer battered her. After so many court hearings, the footballer was restrained from seeing her. The footballer later moved on with Mellissa Blakesley. Ever since they have been linked together, they have chosen to keep most of their affairs off the public eye. They seem to be happy with what they share and their togetherness is blessed with a son named Apollo Fitzgerald. 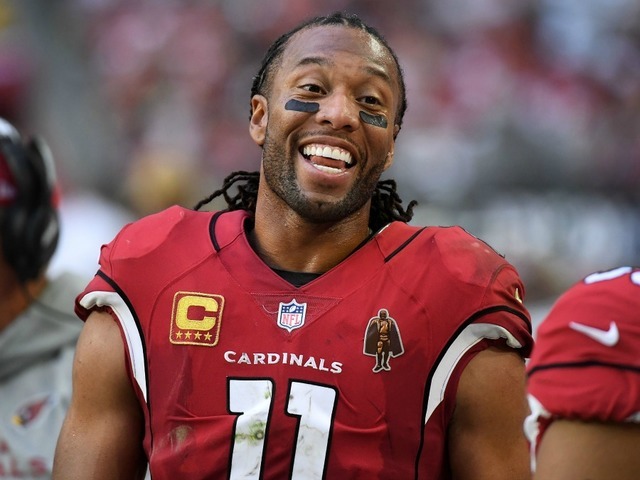 Going Pro was a dream come true for Larry Fitzgerald after having a few difficulties qualifying for the National Football League. Ever since he got in, he has stayed put with the Arizona Cardinals playing with them for over a decade and counting. In 2004, he signed a 6-year deal worth $60,000,000, in 2008 he renewed his deal with the team for 4 years in a $45,000,000 contract. After that, he inked a 7-year deal worth $113,000,000 in 2011 and entered a 2 years deal in 2015 worth $22,000,000. Having proved his worth, the team extended his contract in 2016 for a deal worth $11,000,000. As of 2018, the footballer renewed a one year contract with the team to the financial value of $11 million annual pay. He is one of the highest paid players with the team just like the likes of Chandler Jones, Patrick Peterson, Sam Bradford to mention a few. In all of this, there has nit been a specific figure to his net worth which is stilll being reviewed.